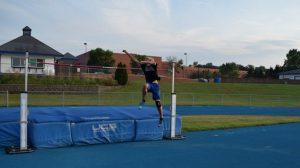 Welcome to the Private High Jump Lessons page! Private High Jump Lessons are for jumpers that need that extra help of more individual attention. Private High Jump Lessons are offered all year around. All Private High Jump Lessons are taught by coach Hugo Munoz (2x Olympian). We offer Private High Jump Lessons in Texas and Minnesota. NOTE: DUE TO HIGH DEMAND, OUR PRIVATE LESSON SCHEDULE IS FULL UNTIL THE END OF AUGUST (WE ARE ONLY CAMPS). FOR HIGH JUMP CAMP INSTRUCTION PLEASE VISIT THE HJ CAMPS LINK AND FOR LONG AND TRIPLE JUMP CAMP INSTRUCTION PLEASE VISIT THE LJ/TJ CAMPS LINK. Private coaching is available for the athletes that are seeking more personal attention in the following events: High jump, long jump and triple jump. All sessions will be video taped. The coach: Hugo Munoz, a two-time Olympian in the high jump and holder of the Peruvian national high jump record – 7’6 1/2.” (2.30mts). NOTE: All 1 on 1 lessons must be registered and paid for in advance through PayPal and are non refundable (including a no show by the athlete). Rescheduling is only an option due to lighting or bad weather. Only athletes are aloud in the jumps area. No pictures or videos (absolutely no cameras, phones, iPads, computers pointing to the jumps area). We videotape all session and post them online for the athletes to see.